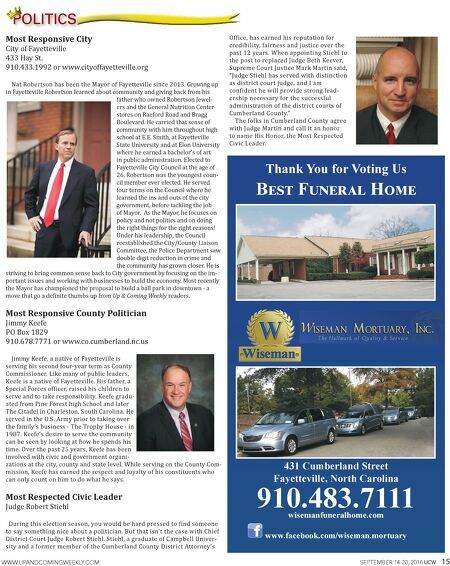 16 SEPTEMBER 14-20, 2016 WWW.UPANDCOMINGWEEKLY.COM POLITICS POLITICS Biggest Local Scandal Spring Lake Misappropriation of Funds Someone gave every employee in the Town of Spring Lake a credit card and told them to charge it. This past year, the bill came due, and it wasn't good news for the small municipality. An audit called for by local citizens showed dozens of officials and town employees in Spring Lake misspent nearly $460,000 over five years, racking up personal pur- chases on town credit cards, buying items without a purchase order and getting travel reimbursements without required paperwork The audit lists 66 current and former positions – no names are included – from the mayor, police and fire chiefs and finance director down to payroll clerks and meter readers who may have broken the law by using town credit cards for personal use. The State Auditor's Office has turned its findings over to the State Bureau of Investigation to determine if any criminal charges are warranted. 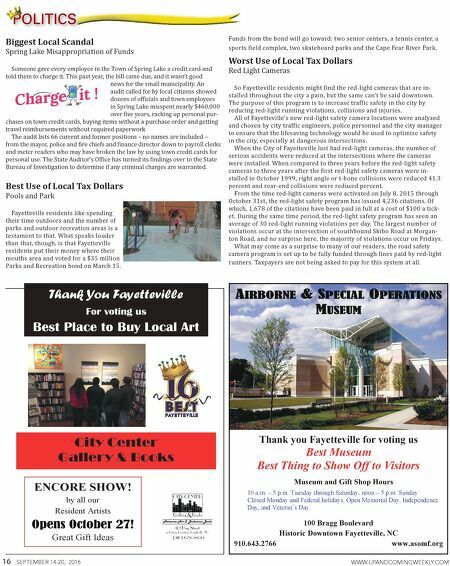 Best Use of Local Tax Dollars Pools and Park Fayetteville residents like spending their time outdoors and the number of parks and outdoor recreation areas is a testament to that. What speaks louder than that, though, is that Fayetteville residents put their money where their mouths area and voted for a $35 million Parks and Recreation bond on March 15. Funds from the bond will go toward: two senior centers, a tennis center, a sports field complex, two skateboard parks and the Cape Fear River Park. Worst Use of Local Tax Dollars Red Light Cameras So Fayetteville residents might find the red-light cameras that are in- stalled throughout the city a pain, but the same can't be said downtown. The purpose of this program is to increase traffic safety in the city by reducing red-light running violations, collisions and injuries. All of Fayetteville's new red-light safety camera locations were analyzed and chosen by city traffic engineers, police personnel and the city manager to ensure that the lifesaving technology would be used to optimize safety in the city, especially at dangerous intersections. When the City of Fayetteville last had red-light cameras, the number of serious accidents were reduced at the intersections where the cameras were installed. When compared to three years before the red-light safety cameras to three years after the first red-light safety cameras were in- stalled in October 1999, right angle or t-bone collisions were reduced 41.3 percent and rear-end collisions were reduced percent. From the time red-light cameras were activated on July 8, 2015 through October 31st, the red-light safety program has issued 4,236 citations. Of which, 1,678 of the citations have been paid in full at a cost of $100 a tick- et. During the same time period, the red-light safety program has seen an average of 30 red-light running violations per day. The largest number of violations occur at the intersection of southbound Skibo Road at Morgan- ton Road, and no surprise here, the majority of violations occur on Fridays. What may come as a surprise to many of our readers, the road safety camera program is set up to be fully funded through fines paid by red-light runners. Taxpayers are not being asked to pay for this system at all. Thank you Fayetteville for voting us Best Museum Best Thing to Show Off to Visitors Museum and Gift Shop Hours 10 a.m. – 5 p.m. Tuesday through Saturday, noon – 5 p.m. Sunday Closed Monday and Federal holidays. Open Memorial Day, Independence Day, and Veteran's Day. 100 Bragg Boulevard Historic Downtown Fayetteville, NC 910.643.2766 www.asomf.org Thank You Fayetteville For voting us Best Place to Buy Local Art Insert Best of Fayetteville Logo here City Center Gallery & Books ENCORE SHOW! by all our Resident Artists Opens October 20! Great Gift Ideas UP & COM I NG W EEKLY 'S Opens October 27!